It was a week or two ago that I came across a band called The Gray Havens. I listened to a few clips and decided to pre-order their first album, an EP that releases today. It turns out that they are readers of this site. I thought it would be fun to do an interview and they thought it would be fun to give you a copy of their album. So here goes! Why don’t you start by telling me a little bit about yourself. Who are you, where are you from–you know, all of those details! I am twenty four years old. I am recently married to my beautiful wife, Licia, who is a part of The Gray Havens as well. We live in Crystal Lake, IL, a Northwest Suburb of Chicago where we attend the Evangelical Free Church of Crystal Lake. Licia spends her week working part time for the church youth ministry and part time for Starbucks. I typically spend my week teaching voice lessons at two local High Schools (one of them being my Alma Mater), as well as performing dueling pianos in a group called Felix and Fingers. It can all seem a bit discombobulating and chaotic at times, especially in recent weeks, but it’s been a great learning sesaon for both of us leading up to the EP’s release. A few years ago you were in the top-24 of American Idol (season 5). Tell me about that experience. What were some of the highlights of being on the show? What were some of the surprises? Any regrets? American Idol was a whirlwind. I have catalogued the full narrative in a 5 part series of blog posts elsewhere, but here are some brief thoughts. The audition process was certainly interesting. You basically have to go through two rounds of audtions before you can stand in front of the actual judges (Paula, Simon, and Randy at the time). Interestingly enough, what actually landed me in front of them was a Louis Armstrong impersonation that I offhandedly mentioned I could pull off in a preliminary interview. In response to the question, “do you have any hidden talents,” I told an AI staff member I could pull off the impersonation fairly well. I ended up being asked to prove it in my executive producer audition. They laughed and sent me through just because of that (they did actually ask me to sing for real though). I think what put me in the top 24 after being able to sing well was the fact that I could diversify their contestant roster as a young guy singing big band and jazz. The greatest part of the whole show was the relationships I made with the other contestants. I grew pretty close with some of them, especially the other minors (we all had to go to “school” during the day). Also, having no idea what each day would be like when I woke up and sharing that experience with my friends was amazing. I loved it. My greatest regret is that I did an awful job of keeping in touch with those on the show, and have virtually lost contact with all of them. Maybe one day I’ll be able to start reconnecting again. Just a few months ago you married Licia. What have you learned about yourself since you got married? What have you learned about marriage? The past four months have been wonderful. I love being married. I would definitely recommend it! One of the hardest things has been identifying the affections that are most in competition with loving and serving my wife. Productivity is one of my biggest ones. It’s so hard for me to not think about all I could be getting done if I weren’t called to sacrificially care for her. In marriage, I have found it more and more true that I should trust whatever I least want to do as the wisest course of action in almost any circumstance. The pull towards selfishness is just that strong. Tell me about the new album. Why did you record it? What ties the songs together? The album is sort of a concept album in that everything centers around one central idea, a song. The first track, “Where it Goes,” is an account of creation, fall, and redemption from “History’s” perspective. The song’s subject matter is a “song” which is meant to represent the fabric of reality that God spoke into existence at the founding of creation. This theme continues in “Silver,” the second track, which is inspired by a conversation between C.S. Lewis and J.R. Tolkein before Lewis was converted. “Lies breathed through silver” was the description Lewis gave to the myths that he and Tolkein both shared a passion for. Tolkein, however, argued that Christianity was the true myth, and therefore distinguishable from myths crafted with “silver.” Therefore, the song is an attempt to capture this kind of imagery that depicts some who grow up with “silver” songs but begin to hear echoes of songs that are of a different nature. They sail off in search of the song’s origin to find that it melts everything silver, which gives them eyes to see the song’s inherent truth. The third track, “Gray Flowers,” stands alone as a gospel narrative story about a town that does not allow “grays.” Grays is really grace. The officials represent the Pharisees. The woman represents the church. The man represents Jesus. You’ll just have to listen to it. The “song” theme is re-introduced in “Train Station” through a more redemptive lens. It depicts a series of well-polished trains and conductors who promise a way of escape and deliverance from the train station for a certain fee. However, one conductor operates a train that is free to any who might accept a ticket from him. The “song” makes its final appearance in “Music From a Garden,” a combination of Genesis 1 and a chapter from The Magician’s Nephew entitled “The Fight at the Lamppost” from Lewis’s Narnia series. It’s about how the song (God’s original design) was so much more full and real at creation, but now can only be heard as an echo until Christ returns. What’s your favorite track from the new album? Why that one? “Silver” is definitely my favorite song. It’s the one that most captures my imagination. It was also just really fun to write some of the chorus parts for it. “Silver is my pick too!” How do you measure success with an album like this one? What would it look like for the album to be successful? We are seeking to illustrate gospel truths vividly through lyric and song, “firing up the imaginations” of both the believing and secular listener. How do we measure whether or not we have been successful? I’m not really sure, so I will just share what we hope for. In an article entitled “Beauty will save the world,” Alexander Solzhenitsyn writes, “through the instrumentality of art we are sometimes sent—vaguely, briefly—insights which logical processes of thought cannot attain.” We desire our music to be edifying to believers and evangelistic at some level to the hearts and imaginations of non-believers. Our desire for the album is also that it might serve as a stepping stone or launching point for other creative projects that will also seek to make truth beautiful. To the extent we see Christ as beautiful, our hearts are changed, which is what will ultimately save the world. I recently finished The Mission of the Church, and am currently reading A Brief History of Thought, and Embracing Obscurity. We actually almost named the band “Subjects and Heralds” after reading The Mission of the Church, which is the language they use to describe our role as Christians in the kingdom of God. In the end “The Gray Havens” (an LOTR chapter title reference) just sounded cooler, so we went with that. Tolkein 1, Deyoung and Gilbert 0. Sorry guys. 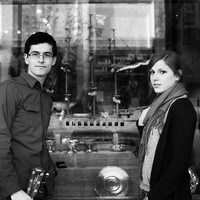 The Gray Havens are giving away the album for a short time. Get it while the getting’s good! Download it here.